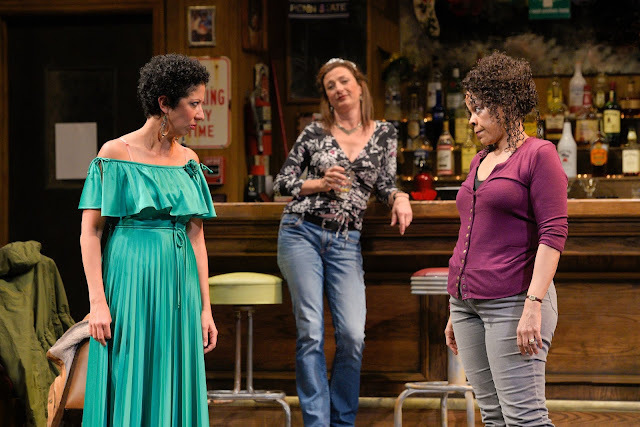 Jessie (Sarah Nina Hayon, left), Tracey (Lise Bruneau) and Cynthia (Tonye Patano) are friends and co-workers. It’s one thing to read or hear about the loss of blue collar jobs when a factory closes. It’s quite another to actually see how a closing can devastate lives. That’s the lesson made clear in “Sweat,” the 2017 Pulitzer Prize-winning drama written by Lynn Nottage and presented by American Conservatory Theater. Nottage switches the action between 2000 and 2008 in Reading, Pa., a once-thriving factory town. It opens in 2008 as a parole officer, Evan (Adrian Roberts), separately questions two young men, the white Jason (David Darrow) and the black Chris (Kadeem Ali Harris). He asks what they plan to do now that they’re out of prison. Why they went to prison doesn’t become clear until much later in the play. After that, most of the action takes place in 2000 in a bar managed by Stan (Rod Gnapp) and frequented by workers from a nearby factory. Besides Jason and Chris, the regulars are Tracey (Lise Bruneau), Jason’s mother; and Cynthia (Tonye Patano), Chris’s mother; along with the women’s friend Jessie (Sarah Nina Hayon). They’ve heard rumors that the plant’s new owners might close it and move to Mexico, but they believe their union will protect them. However, when Cynthia is promoted into management and the owners want to negotiate a new contract with major concessions, her friends accuse her of betraying them. She counters that she’s doing everything she can to help them. she got from Oscar (Jed Parsario). A strike ensues. Oscar (Jed Parsario), Stan’s Hispanic helper in the bar, turns scab and crosses the picket line. Tensions reach a boiling point until the brawl that sent Chris and Jason to prison. Subsequent scenes in 2008 show just how hard life has become for nearly everyone. Their fate was previewed in 2000 by Brucie (Chiké Johnson), Cynthia’s ex-husband. He became strung out on drugs after losing his job at another factory. Directed by Loretta Greco, artistic director of Magic Theatre, the ensemble cast is terrific at building the tension, its climax and the aftermath. 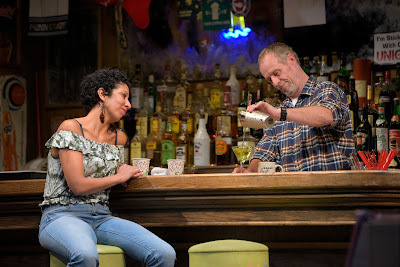 Stan (Rod Gnapp) pours another drink for Jessie (Sarah Nina Hayon). Gnapp is especially effective as Stan, the bartender who offers sage advice, mostly keeps the peace and truly cares about his customers. Greco is aided by Andrew Boyce’s set design augmented by Hana S. Kim’s projections. Costumes are by Ulises Alcala, sound by Jake Rodriguez and lighting by Allen Lee Hughes. “Sweat” is painfully relevant to what’s happening today. Although it premiered at the Oregon Shakespeare Festival in 2015, before the 2016 presidential election, it shows how Donald Trump’s rhetoric and his “Make America Great Again” slogan could resonate so deeply among some voters. It’s a powerful, theatrical work that is must viewing for those who seek insight into some Americans’ malaise. Running about two and a half hours with an intermission, it will continue through Oct. 21 at ACT’s Geary Theater, 415 Geary St., San Francisco.